Sisense Hunch™ is proving to be a valuable tool for customer-relationship intensive industries such as Telecoms, to help them enhance decision-making when developing strategy and customer campaigns With Sisense Hunch, telcos can accelerate their analysis of customer behavior, with a view to identifying and implementing new initiatives to enhance customer loyalty and attract new customers. Sisense Hunch’s Data cognition engine answers complex queries of any kind, instantaneously and with pinpoint accuracy. Telecom is a fast-moving industry that runs on data and needs quick answers to business questions. A large number of different offers for bundles, add-ons, reaction to competition and new price plans run in parallel and they all require a strong solution to help decide which campaigns should get the green light. As a decision-maker, how many times did you wish to be able to answer “what-if” questions during the design of campaigns? For example, did you ever consider what would be the effect on your revenue of offering a bundle that gives users “Free 1GB of Mobile Internet”? Or maybe you want to know how many customers make international calls from old Samsung feature phones compared with smartphone users that have between 150-200 minutes of monthly talk time as part of their package? You can ask your analytics or BI team to send you this kind of information. But how long will it take? It’s not a secret that BI and analytics teams are over-loaded with many queries, reports and ad-hoc answers to management, so queries of this kind could take hours or days to answer. On many occasions, by the time you get the answer, you have already forgotten what you asked for. This is exactly where a Data Cognition tool like Sisense Hunch can help. It can answer any “what-if” business question in a fraction of a second. You no longer need to wait to get answers. Regardless of the data size, billions of CDR records or any input from data warehouses, the results will still pop on your PC, tablet or mobile in milliseconds. Pre-Paid customers top up their mobile phones when they need to, and they are quite anonymous because they don’t have contracts that keep them with one operator. Churn is hard to predict. reacting quickly to them is critical. To achieve this balance, operators need to perform “what if” questions and sensitivity tests. This isn’t easy, as the normal analytic environment lacks the performance to interactively explore data. Running multiple scenarios interactively results in saving longitudinal A/B tests and makes it possible to decide whether to give the green light to each idea. In scenarios such as this, Sisense Hunch offers an ideal tool to expedite the decision-making process. 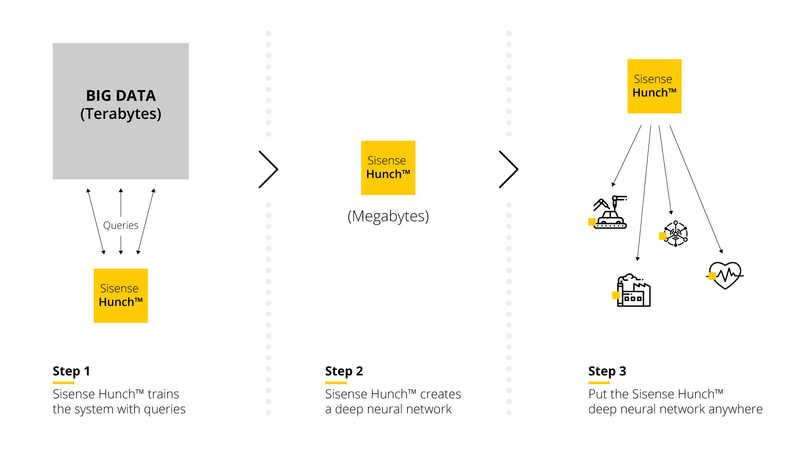 Sisense Hunch is a Data Cognition Engine that rewrites the rules of Big Data analytics, condensing immense amounts of data into lightweight neural networks for quick and easy analysis at the edge. teams to produce valuable insights for decision making. What is the Magic of Sisense Hunch? How Does Sisense Hunch Work? After data is extracted, Sisense Hunch creates a huge set of possible queries to build its model, assuming your dataset presents variability in columns distribution and has no missing data. Then, Sisense Hunch uses this information to train a type of machine learning algorithm called a Deep Neural Network (DNN). The output of the training is a tiny but representative fraction of the original data. It enables the data to be placed in a PC, tablet, cloud or edge device and it answers queries directly with sub-millisecond response time and 99% accuracy or better for most datasets. Let’s refer to the telecom pre-paid example we previously mentioned: “What will happen to the ARPU if you offer a free 1GB bundle on your next top-up?” To measure the effect of ARPU change on 10M customers queries were run with more than a dozen variables included: Data usage, MoU (in and out minutes of use), Roaming, International calls, customer segment, type of Handset Model, Bundle usage, top-up history behavior, Time-band usage and calling circle. The data that was extracted from the data warehouse included 6 months’ historical behavioral-usage data. The file was 3GB without missing data. Usually, in order to analyze the potential of a new bundle, many queries are run on a tier-1 analytic software. Once Sisense Hunch was introduced, it ran in parallel to compare both efficiency and the results. simulation now pointed to more than €8.41. In this process we ran many scenarios that took around 5 hours, resulting in 15 new campaigns for the 1GB free bundles. Following this, and having trained the data with Sisense Hunch, we tested the same “what if” scenarios. Each scenario took only 8 milliseconds to generate results compared to the statistical software that took between 80 – 200 seconds. That’s 10,000 times faster. The entire process took a total of about 24 minutes and it will be further improved in the future. And with Sisense Hunch, each result was generated instantly with 99.8% accuracy. Plus, Sisense Hunch helps you work interactively, without the need to go back and forth between the query and the results, enabling marketers to better observe and track the differences between the multiple scenarios and subsequently immediately tune the most appropriate to achieve the best gain. For Telecom marketing teams, Sisense Hunch is not simply a new feature. It enabled a new business process that was not possible before. As such, it’s a new class of business analytics for fast decision-making. Sisense Hunch has significant contributions/advantages that enable agile business and marketing processes and the cost reduction of analytical environments. Sisense Hunch dramatically increases marketers’ agility, productivity, effectiveness and work quality. In fact, due to the instant interactivity of Sisense Hunch’s data exploration capability, it can revolutionize marketing processes, starting with quick Go / No-Go business decisions up to a new level of teamwork, interaction, and creativity. This enables quick idea validation that results in better business performance and competitive edge. Additionally, with today’s IT Infrastructure budget constraints, Sisense Hunch excels in dramatically optimizing the cost of servers, storage (CAPEX) and Analytic software licenses as well as in their maintenance & operation cost (OPEX). 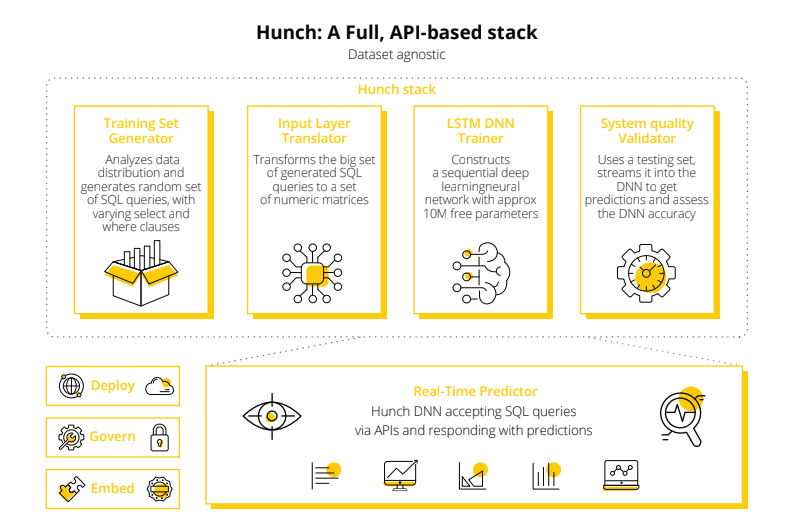 Sisense Hunch shifts complex computation performance to the DNN domain, thus overcoming the challenges of BIG DATA analytics. It isn’t just a new capability. It’s a new class of analytics! “What-if” business questions can be answered in milliseconds by anyone using Sisense Hunch’s Data Cognition Engine, regardless of query complexity and the size of data.